I have not posted the put/call ratios in a while. 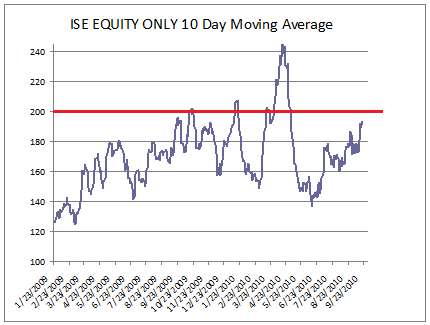 Below is a look at the 10 Day moving average of the ISE Equity only. The 200 level has given the market problems since the March 2009 lows, save for April, when the ISE equity 10 Day MA made an all time high. I believe April was an outlier and that extreme of a level of bullishness is very rare. 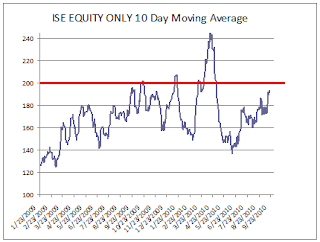 If the ISE Equity closes the day where it is now the 10 day moving average will be above 200. I should note that the CBOE readings are not confirming this extreme of a reading. I always prefer when multiple indicators are saying the same thing. What is clear is that sentiment is no longer an asset for this market. Don't know why, but the CBOE tends to give better signals in my experience. That said, with all the supply in the short term the short side may be a free look at least while the supply is digested in the market. The supply is definitely the straw that makes me want to go short. Barring that I would not be that eager right now.